Healthy Peanut Butter Pretzel Bites made with natural peanut butter and a sugar substitute that won’t send your glucose levels sky high. 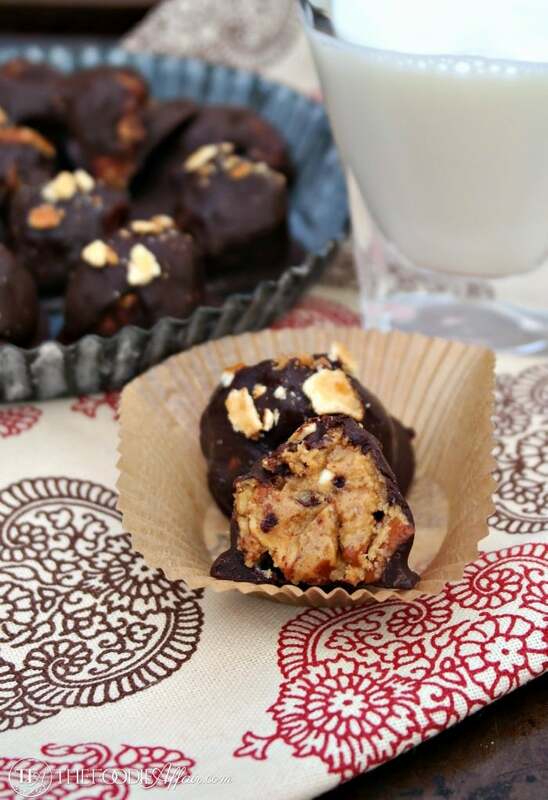 This no bake protein snack is a peanut butter lover’s delight! Have you tried Skippy’s peanut butter bites? They’re these itty-bitty morsels that are a little bigger than the size of a pea. They’re kind of hard like a dried pea too, but they’re made with a dense coating of peanut butter around a tiny pretzel in the middle. My co-worker, Ann has been bringing them to work and goodness are they addictive! I’ve been limiting myself to just a couple, but I could easily grab a handful and eat them like popcorn! 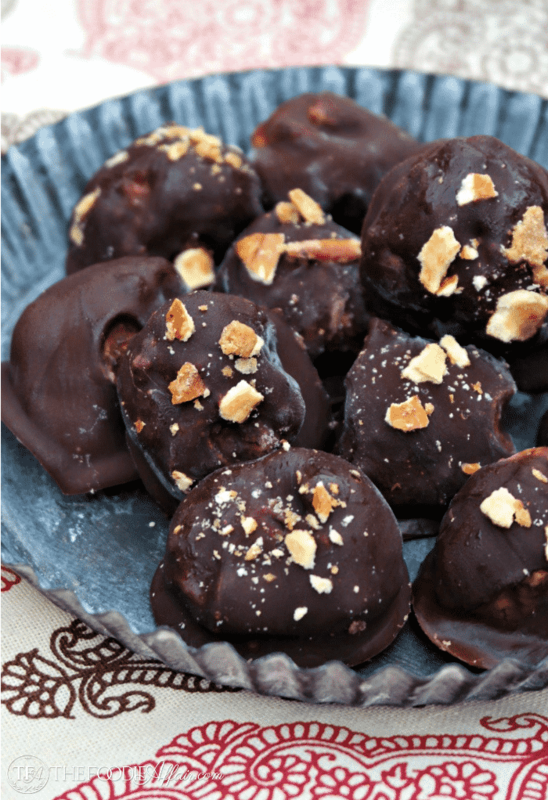 I decided to make it my mission to make a healthier version of those delights with simple ingredients like natural peanut butter and dark chocolate, which are both decadent, but using healthier fats and making them larger will leave you satisfied with just one Peanut Butter Pretzel Bite instead of a half dozen! 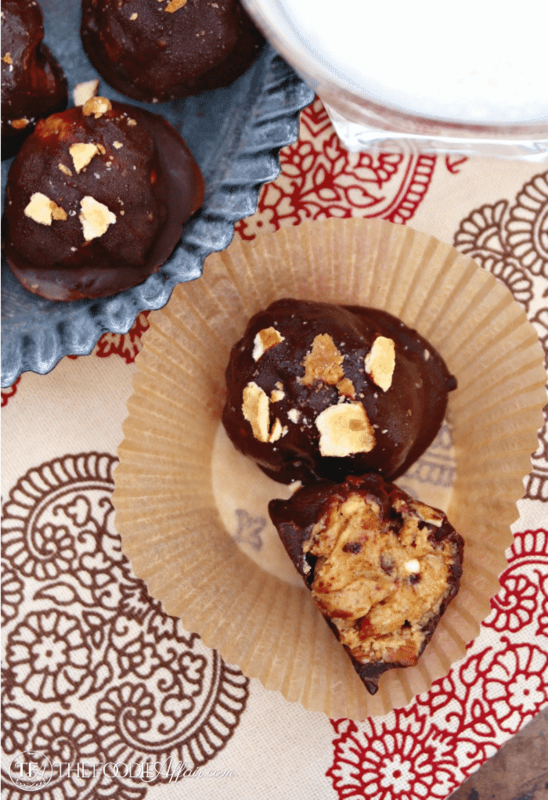 These peanut butter balls are the perfect mid-afternoon snack! You’ll love the creamy filling mixed with a crunchy texture from the pretzels, and of course the chocolate coating is an added bonus! 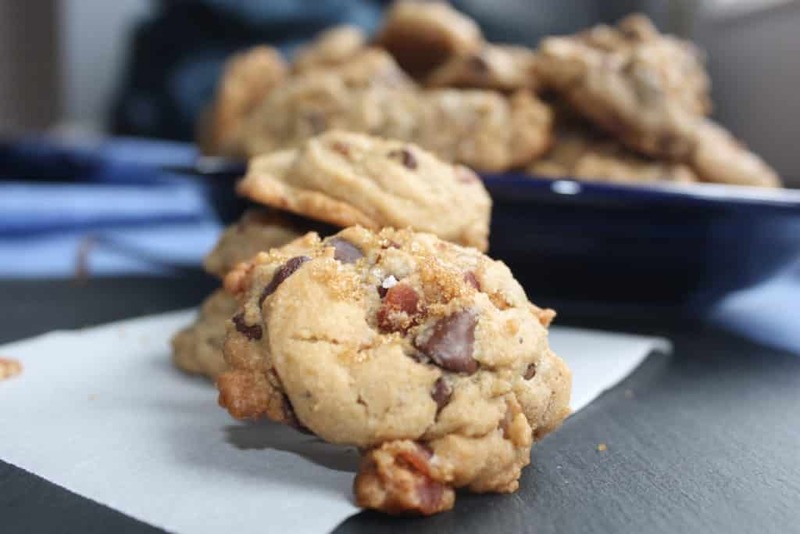 These sweet and salty treats are great for summertime munching, especially when you have kids at home looking for a rib sticking satisfying treat! Each of the Peanut Butter Pretzel Bites are about 125 calories with 13 grams of carbohydrates. If you want more no-bake snacks you also might want to try these gluten-free Protein Bites or these No-Bake Chocolate Peanut Butter Cookies. In a medium bowl mix together peanut butter, dried milk, sweetener until well blended. 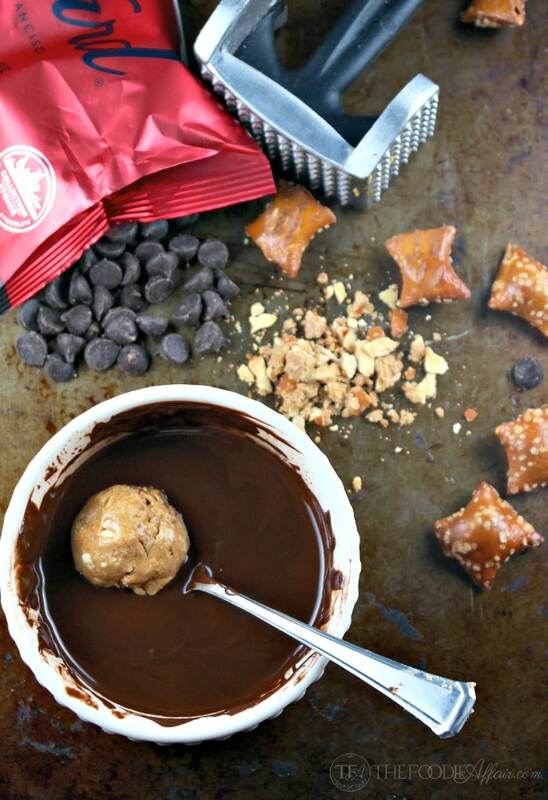 Fold in crushed pretzels and place in the freezer for at least 30 minutes. Remove from freezer and scoop about a tablespoon of dough and roll with your hands into 1/2-1 inch balls. Place on baking sheet lined with parchment paper. Put back in the freezer for another 30 minutes. 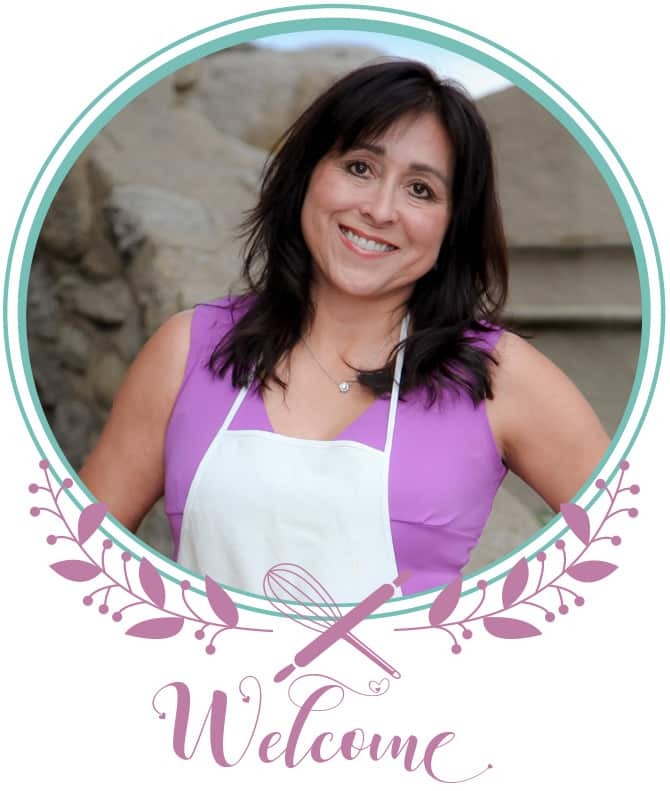 In the meantime, melt the chocolate with the coconut oil over a double boiler or in the microwave (stir every 30 seconds) until smooth. 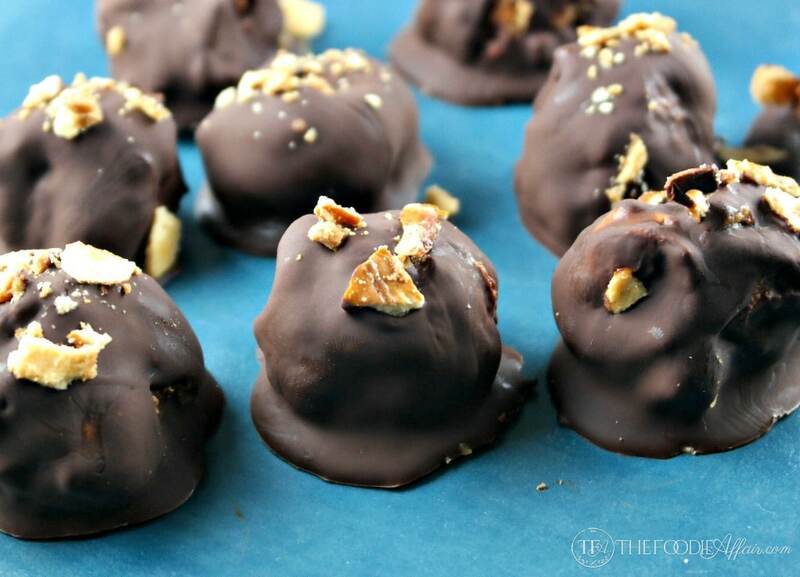 Dip each peanut butter ball in the chocolate and after coating the balls place on parchment paper. Garnish with crushed pretzels and let chocolate coating harden in the refrigerator. Once set enjoy! Store in the refrigerator or freezer in an airtight container. These look so good, wish I could take one right out of the screen! They sound amazing, and really quick to make to. I think I might whip up a batch today. Hope you do and enjoy the heck out of them! Skippy is my favourite brand of peanut butter but I’ve never had the bites or seen them here in the UK. These look like they’ll get eaten in no time! I’m not sure where to buy them either, which is ok by me since these are so easy to make at home. Healthier than store bought too! These are rather delicious looking. Love the photos, the pretzel bites look very inviting. Thank you, Mark! The crunchy pretzels add nice texture next to the creamy peanut butter! I love that you made these healthier and I can totally get behind any sweet treat that is no bake! They look great. No bake treats are so easy to mix up, especially during the summer months when you don’t want to turn on the oven often! These look so delicious and easy to make too! Im a peanut butter fan and have to make them soon..
You’ll love having these around and they’re simple to make! Mmmm these look like just the kind of healthy treat I could eat daily. Thanks for the inspiration!